There’s a lot to like and a lot to dislike in Canadian science fiction writer Robert Sawyer’s new novel. On the positive side, this is the most ambitious sci-fi novel I’ve read in ages. The writing is skillful — among other things, seamlessly switching between first person and third person narration — and the primary character is believable and sympathetic, if a bit on the irritating side. 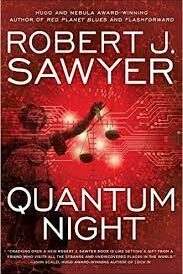 Sawyer uses the novel as a platform to talk intelligently about philosophical and ethical big issues — something all too rare in contemporary science fiction: Quantum Night makes you think. As well, Sawyer obviously did a thorough job of researching the novel’s background, the supposed quantum-related nature of consciousness — an area in which I’m totally out of my depth. On the negative side, it’s difficult to buy the political background in which Quantum Night is set, especially that in the U.S. border areas (where I live). As well, Sawyer sets up an essential (for the secondary plot) series of events (riots) for which he provides no explanation. Beyond that, from the point of view of psychology (an area in which I do know a bit), it’s very difficult to buy Sawyer’s underlying deterministic premise about the nature of consciousness and how it varies in the population. Beyond that, Sawyer provides the most nauseatingly graphic description of violence I’ve ever read; I found the scene so disturbing that I put down the book for several days before deciding that I really did want to see how the novel concluded. Quantum Night begins with a cringe-inducing series of scenes in which the protagonist, academic psychologist Jim Marchuk, a specialist in diagnosing psychopathic tendencies, learns that he has no memory of six months of his life as an undergraduate, and that he apparently did terrible things — things totally out of character — during those six months. Marchuk shortly reconnects with his girlfriend from those lost six months, Kayla Huron, a quantum physicist who, to quote the endflap, “has made a stunning discovery about the nature of human consciousness,” and not coincidentally has developed what she considers a foolproof method of diagnosing psychopathy. There are, however, nonphysiological reasons to doubt that it is plausible. If people were pure behavioral animals reacting mindlessly to external stimuli (p-zeds), they wouldn’t react radically differently to identical stimuli and wouldn’t be almost universally at least somewhat emotionally disturbed. (We’re talking about the garden varieties of emotional disturbance here, such as anxiety and depression, not trauma-induced PTSD.) Pertinently, the most effective type of psychotherapy, cognitive behavioral therapy, is, to simplify, based on the premise that what people (often subconsciously) tell themselves largely determines their emotions: change what you tell yourself — deliberately tell yourself rational instead of irrational things — and you’ll minimize your emotional disturbance. And it works. So there go your “philosopher’s zombies,” who by definition don’t tell themselves anything. The unmotivated rioting is difficult to buy, the pogroms are equally difficult to buy, and it’s inconceivable that any U.S. court, no matter how reactionary, would ever declare such a law redefining murder constitutional, even in Texas. And if pogroms ever would break out down here along the border, it’s absolutely certain that there would be armed resistance; people would not meekly accept it. The reason for this dire background is to set up a secondary plot — what can our heroes do about these things? This is unfortunate, as the primary plot — Marchuk’s journey of discovery about what he did and why — is more than adequate, and the secondary plot seems implausible. This is a horrendous belief, one that is an integral part of the foundation of some of the worst forms of totalitarianism. Leninism, a conspicuously utilitarian political philosophy (which is supposed to produce the greatest good for the greatest number), is the example par excellence, and its terrible results when imposed are too well known to enumerate here. Suffice it to say that a very large number of human problems, both individual and societal, are a direct result of those (such as Sawyer’s protagonist) who consider themselves more enlightened than the great unwashed masses and play god with the lives of others — for their “own good,” of course. Still, despite its warts, Quantum Night is well worth reading. The writing is first rate, Sawyer provides much thought-provoking discussion of philosophical and ethical problems (mostly in chapter introductions recounting Marchuk’s class lectures), the characters are believable and somewhat sympathetic, and the plot will have you on the edge of your seat throughout most of the book. Zeke Teflon is the author of Free Radicals: A Novel of Utopia and Dystopia. He’s currently working on the sequel and on an unrelated sci-fi novel in his copious free time. The first six chapters of Free Radicals, are avaukable here in pdf form.